Jones, G., Rosenthal, A., Segev, D., Mazur, Y., Frolow, F., Halfon, Y., Rabinovich, D., Shakked, Z., Isolation and identification of 24,25-dihydroxy vitamin D2 by use of the perfused rat kidney. Biochemistry, 1979, 18(6):1094-1101.; Horst, R.L., Littledike, E.T., Riley, J.L., Napoli, J.L., Quantitation of vitamin D and its metabolites and their plasma concentrations in five species of animals. Analytical Biochemistry, 1981, 116(1):189-203. 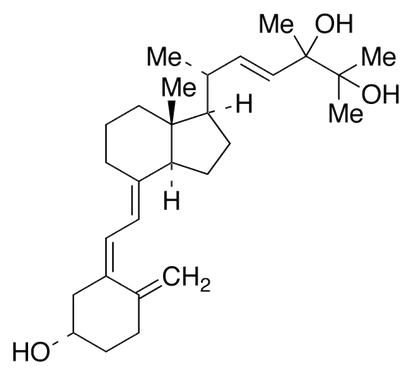 Description: A metabolite of Vitamin D2, a synthetic analog of Vitamin D.